Environmental restrictions for large-scale projects such as hydropower plants, oil and coal thermal power plants, associated with the need to produce energy near the consumption point, have an impact on the reduction of energy costs and arouse Brazilians’ interest in other types of energy, in particular solar power generation. Brazil still needs to be challenged with the creation of innovative solutions for different markets and, in order to serve customers with this potential, Braskem, the largest petrochemical company in the Americas, has partnered with Ciel et Terre Brasil - a joint venture between the France-based Ciel & Terre and the Brazilian company Sunlution, owner of the Hydrelio® technology of floating photovoltaic generation - which offers several advantages over the traditional technology for solar power generation on land. Hydrelio®, a technology developed by Ciel & Terre, is a pioneer in the world market for floating solar generation plants and is composed of photovoltaic panels arranged on high-density polyethylene floats manufactured with Braskem resins. With the purpose of supporting the partner in the development of the domestic market, the petrochemical company worked not only on the adequacy of the polyethylene resin, but also on the identification of processing equipment for the local production of the floats, as well as support in the modeling of the business in the Brazilian market. “Braskem’s role in the development of this solution has been crucial. The initial demand, which was to define a resin that could meet the technical requirements for floats has become a high-potential business opportunity, given the range of markets in which Hydrelio® can be made viable and employed,” said Jorge Alexandre, responsible for Braskem’s PE Market Development for construction and infrastructure. The solar float boards can be applied to a wide range of water surfaces, such as industrial and retention basins, irrigation and drinking water reservoirs, desalination and water treatment plants, ponds, and canals. The most significant benefits in the use of this technology include the release of land plots, which would be occupied by the traditional solar generation system, for uses aimed at rural production (livestock, agriculture, etc. ), reduction of network connection costs by the use of existing electrical infrastructures, increased photovoltaic productivity due to the natural cooling of the system by the water surface, and simpler and cheaper maintenance, among others. Ciel & Terre is investing on Hydrelio® as a sustainable solution not only for distributed generation, but also for hybrid power generation, and expects a significant turnover by the end of the year. “Ciel & Terre has extensive knowledge of photovoltaic plants and, as we develop Hydrelio®, we expect to increase solar power generation by enabling two sources operate simultaneously in a single infrastructure. Our Hydrelio® product is the smallest investment solution to increase power generation in existing hydropower and wind farms, and we believe that Brazil has enormous potential for this market,” said Orestes Gonçalves Junior, Managing Partner of Ciel & Terre Brasil. The first project implemented in Brazil with Hydrelio® has just been completed at Fazenda Figueiredo, in Cristalina, GO, which invested on this new technology as a means to solve its energy consumption needs. 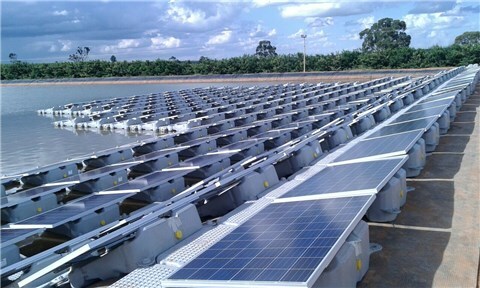 The construction of the photovoltaic plant on a rainwater collection pond allowed the generation of energy in an area that was in disuse, with greater efficiency due to the cooling of the temperature of the photovoltaic panels installed in the water course, in addition to reducing evaporation of the lake water. Studies by the company Ciel & Terre International point out that this type of technology generates approximately 14% more electricity than solar generation on land or on roofs. Ciel & Terre has been developing floating photovoltaic plants for private (commercial or industrial) or state use since 2010 and intends to generate solar energy not only in agricultural and livestock farms, but also in reservoirs of hydropower plants, as well as taking advantage of existing infrastructure facilities, with a focus mainly on reducing evaporation and, subsequently, water conservation, thereby preserving existing ecosystems and improving water quality, as well as reducing algae development and erosion of the banks of the reservoirs with decreased rippling. With a global, human-oriented vision of the future, Braskem’s 8,000 members strive to improve people’s lives by creating sustainable solutions in chemistry and plastics. It is the largest resin producer in the Americas, with an annual output of 20 million metric tons, including basic chemicals and petrochemicals, and R$55 billion in revenue in 2016. It exports to Customers in approximately 100 countries and operates 41 industrial units, located in Brazil, the United States, Germany, and Mexico - the latter in partnership with Mexico-based company Idesa.